Come and join us for our annual SPRING CONCERT! 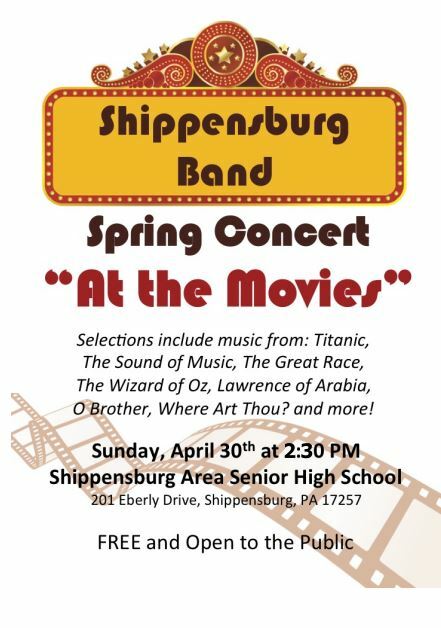 For the sixth year, the Shippensburg Band invited instrumental students in grades 6 through 12 from six surrounding counties to compete for scholarship funds and the opportunity to perform as soloist with the Shippensburg Band at our Spring Concert Sunday April 19th at 2:30 PM in the Shippensburg High School Auditorium. Alan Tolbert, son of Christine and Douglas Tolbert of Shippensburg, won this honor and is performing the first movement of Sonata for Trumpet and Band by Kent Kennan. Alan takes individual trumpet lessons from Mark Wilson and is a Junior at Shippensburg Area Senior High School, where he participates in the band program directed by Robert Maag, including the marching band, concert band, pep band, symphonic orchestra, jazz band, and pit orchestra. He is a member of the National Honors Society, a Civil War Re-enactor (bugler) on the Federal Volunteer Brigade staff, a re-enactor in the 3rd Maryland Volunteer Infantry Regiment Company B, a member the drama club, a member of the cross country team, the founder of the SASHS Pep Band, and a participant in his church youth group. Alan began playing the trumpet in fifth grade at age 10. He chose the trumpet because he desired play the bugle (a closely related brass instrument to the trumpet) at Civil War reenactments. His first choice was to play the drums, but Mark Wilson, the fifth and sixth grade band director at SASD and his current trumpet instructors, said that he should try the trumpet because there were too many percussionists; it was the best decision of his life. Alan has been recognized previously for his talent on trumpet. He won the Most Outstanding Musician Award at the National Civil War Field Music School in 2010. He has played Taps at numerous ceremonies and funerals, including two occasions at Arlington National Cemetery: a ceremony remembering Taps’ 150th birthday, and JFK’s 50th assassination anniversary. Alan was a selected for the 2012 Cumberland County Middle School Band, the 2014 Cumberland County High School Band, the 2014 PMEA District 7 Upper Band, the 2015 PMEA District 7 Upper Band, the 2015 Cumberland County High School Band, the 2015 PMEA District 7 Symphony Orchestra, the 2015 PMEA District 7 Wycliffe Gordon Jazz Band, the 2015 PMEA Region V-State Band, and most importantly, the 2015 PMEA All-State Wind Ensemble. Besides performing with these honors group, Alan is a member of the Calvert Arms Fife and Drum Corps, (fife and drum corps of my reenacting group), and the Chief Bugler on the Federal Volunteer Brigade’s Staff. 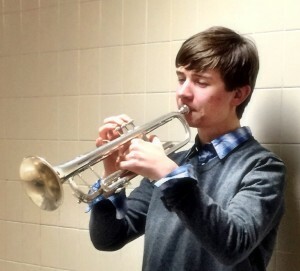 He performs at his church, Messiah United Methodist in Shippensburg, on a regular basis and he is a member of the Central Pennsylvania Friends of Jazz Youth Band. Alan selected this particular solo piece, the Kent Kennan Sonata, since it encourages a trumpet player to focus on musicality and technique. Every part of it is difficult and when played well, it really conveys a great musical mood. It not only challenges him physically, but especially mentally. This piece is also a healthy challenge for the musicians in the band. Congratulations to our winner, his parents, teachers, and other supporters. We are looking forward to his performance at our Spring Concert on April 19th and encourage you to attend. 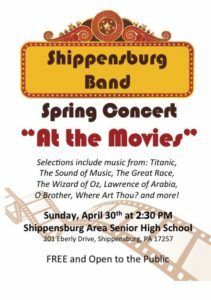 Come enjoy a Sunday afternoon concert with different music styles played by members of the surrounding communities, musicians from high school students to octogenarians. 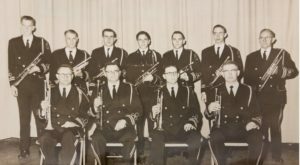 A variety of pieces from the Band’s library is presented at every concert, including marches, classical transcriptions, patriotic tunes, Broadway show tunes, folk music, contemporary works, light opera and hits from the big band era. The concerts are popular, often due to the patriotic appeal of the music and performance and the variety of styles that are presented. 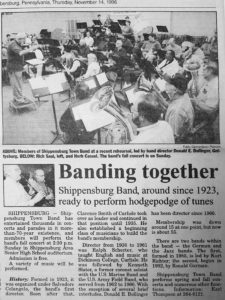 The Shippensburg Band, directed by Carl Sponenberg, is a community band that has gathered many individuals from Shippensburg, PA and surrounding area to make music and share it with others. 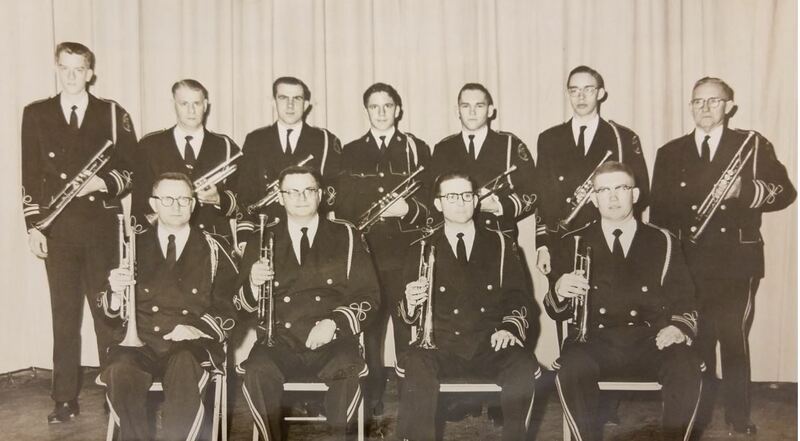 The band is a dynamic group of young and old from all walks of life, some with degrees in music and/or music education, but most participants are amateurs. We rehearse on Tuesday nights between 8:00 PM and 9:30 PM in the Shippensburg Area Senior High School Band Room. Anyone who plays a band instrument is invited to come to a rehearsal and join the band. Keep live music alive in Shippensburg! As the 2015 winner, Alan Tolbert will perform in the Shippensburg Band’s Spring Concert, playing the first movement of Kent Kennan’s Sonata for Trumpet. We are offering $1,000 in prize money! While there are many of these types of competitions for students of orchestral instruments, very few are for students of band instruments. We want to offer this opportunity to school-aged students from the surrounding area, including only Adams, Cumberland, Franklin, Fulton and Perry Counties in PA, and Washington County in MD. Please feel free to duplicate the announcement poster and application form. While we have attempted to identify all schools in the six eligible counties, it is possible that we have missed a few, so we thank you for sharing this information with your music colleagues in both the public and private sectors. Thank you for distributing this information to students in your area, and please encourage them to apply.